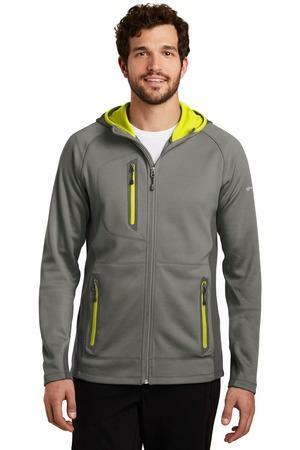 This athletic-inspired, midweight jacket pairs smooth-faced fleece with stretch side panels for comfort during active adventures. Three-panel hood with contrast lining. Reverse coil zippers, welded zippered contrast pockets. Contrast Eddie Bauer heat transfer logo on left sleeve. Made of 12.8-ounce, 100% polyester diamond dobby fleece with an anti-pill finish inside. 88/12 poly/spandex side panels.